Product #1781 | SKU 338 | 0.0 (no ratings yet) Thanks for your rating! Allow the operator to make fine adjustments up to +/- 5 degrees. 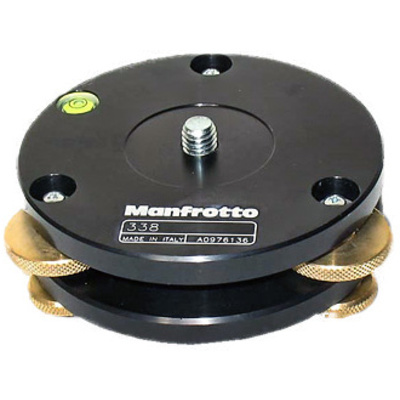 The Manfrotto 328 - Levelling Base is fitted between tripod and head and is used in combination with tripods that don’t have built-in levelling mechanisms. Its three adjustment dials enable the operator to make fine, finger tip adjustments up to +/- 5 degrees to ensure the camera is perfectly level. The dials also have locking rings to ensure stability once the right position is reached. A spirit level is built in for reference. The base has a 3/8” female tripod fitting and a 3/8” male head fitting. The 338 Leveling Base is ideal for use with stitching and VR programs. It allows you to work more easily with photo stitching software programs, to create seamless panoramic photos every time.